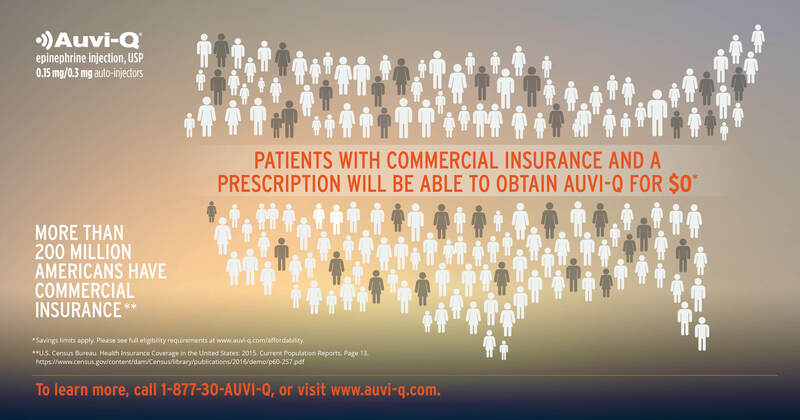 o More than 200 million Americans with commercial insurance, including those with high-deductible plans, will be able to obtain AUVI-Q for $0 out-of-pocket. o AUVI-Q will be available free of charge to patients with a household income of less than $100,000 who do not have government or commercial insurance. o The cash price for AUVI-Q is $360, and will be available to those patients without government or commercial insurance. “We met with patients and physicians and listened to the very real challenges in the current healthcare environment with obtaining access to affordable medicines,” said Spencer Williamson, President and CEO of kaléo. “As a result, starting February 14, for more than 200 million Americans with commercial insurance, including those with high-deductible plans, the out-of-pocket cost for AUVI-Q will be $0.” AUVI-Q is a FDA-approved prescription medicine used to treat life-threatening allergic reactions, including anaphylaxis, in people who are at risk for or have a history of serious allergic reactions. It is an epinephrine auto-injector with innovative features such as voice instructions that help guide a user with step-by-step instructions through the epinephrine delivery process and an automatic retractable needle system, a first for epinephrine auto-injectors, that injects the epinephrine and retracts the needle back into the device within seconds. Identical twin brothers, Eric and Evan Edwards, the inventors of AUVI-Q, grew up with life-threatening allergies. They know what it is like to live in fear of that life-or death moment, both as patients and parents of food-allergic children. Their goal was to develop an epinephrine auto-injector that contained innovative features, such as a voice instruction system that helps guide patients and caregivers step-by-step through the injection process. Eric and Evan Edwards believe and trust in AUVI-Q, not only for themselves, but also for their children and other families who may have to depend on it to administer epinephrine during an allergic emergency. View the full press release here. View the FAQ\\\'s here.